I find navigating through to commonly used folders in the media tab to be quite tedious at times, if I for example want coblestones and search for coblestones it brings up many other results before bringing me to the coblestone folder. It would be very handy to be able to right click on any texture folder and add it to a new tab called "Favorites" or "Shortcuts" and basically that acts as either a shortcut to that folder or maybe it lists all of the textures under that tab. This way we can isolate the main folders we use to a certain tab and can search through them without getting a lot of irrelevant results. It would help to streamline the mapping process a lot. That way I can keep my most commonly used folders in my favorites tab which is usually wood, stone and nature and if I need any other folders I could just go to the main media tab. You may want to log a tracker, and may I add a revision to your request - if we had alphabetic filtering this would greatly speed up searching..
Edited by Bikerdude, 17 April 2018 - 09:34 AM. I'll wait and see what Greebo says first before doing the bug tracker, as for the alphabetic filtering I think that would be best suited for the media tab rather than the new tab as the new tab is only intended to have a couple of folders. But I could see the use for ordering in that way for the current media tab. It's a good idea, but I don't think it should be a separate top-level tab, because those tabs cover a lot of different things besides Media and it wouldn't be obvious what a Favorites tab should apply to (is it textures, media, AI, scripts, entity properties?). Logically it would make more sense for favourite media items to be shown on the Media tab in some way. For example, there could be two top-level categories in the tree, "Favorites" and "All", which could be expanded as desired, or maybe some other control to switch between favorites and the complete tree. I disagree as having a favorites subtab inside the media tab wouldn't solve all of the problems i'm listing here. If you tried to search inside there it would list all of the irrelevant files still and say if you wanted to jump to a different folder in favorites and were in a few subfolders in media you would have to jump back a few folders and go searching for it, rather then just clicking on the tab designated for it. In terms of it being obvious as to what it is, favorites could only really refer to either media or textures, as it wouldn't make sense to have favorites among the script, entities, ai or console tab. And when you would click on it it would have the same visual style as media so it doesn't have anything to do with textures which is for thumbnail previews mainly. So basically I think it wouldn't take much thought or effort to conclude this is a tab for favorite folders under media. Doing other things such as giving it the same icon as the media tab and placing it next to media would also help to increase that immediate association even further. You're right that is a limitation of separate top-level categories in the tree, but there are other potential ways of exposing this feature within the Media tab, such as with another tab widget, radio buttons etc. Doing other things such as giving it the same icon as the media tab and placing it next to media would also help to increase that immediate association even further. In my opinion, adding a whole new top-level tab for a feature which is logically an enhancement to the functionality of one other tab, is inappropriate. This is a convenience feature for the media browser, not a separate top-level category which needs its own dedicated, permanently-visible tab in the main UI. Of course this is just my personal opinion — I'm not at this stage proposing to implement the feature myself, and if somebody else eventually does, they may have different views about how it should be presented. I don't see how it's inappropriate to add a new tab among the others as there is plenty of free space and adding a new tab that would see heavy use doesn't detract from the other tabs, but look ultimately it's up to Greebo if and how this feature gets implemented. I just put forward the initial proposition with the hope that the final implementation addresses the two main concerns (clutter searching and having quick access to shortcuts to commonly used texture folders). The two small tool buttons above the tree view would act as radio buttons, allowing the user to choose between favourites and all items (there is probably a better symbol for "everything" than the infinity symbol, but that's what I could come up with in five minutes). Switching modes would change the displayed items in the tree view, but position and selection would be preserved in the two modes, so that you won't lose your position in either list when switching back to it. Adding to favourites would be done through the context menu, and obviously there would need to be a corresponding "remove" option on the favourites list itself. The combination of the tree view and tool buttons could then be combined into a reusable compound widget which could be used to apply this functionality elsewhere, such as in the model and entity choosers. 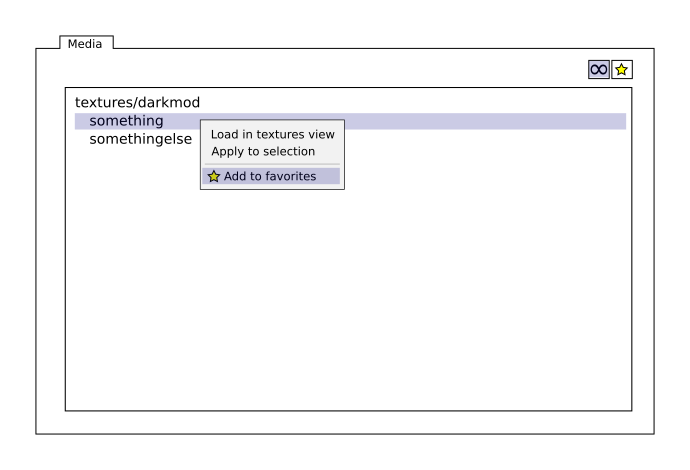 I suspect much of the code could be reused too although I'm not fully up to speed on how wxWidgets handles tree views. That looks great, I really like that idea too! @Goldwell: please open a tracker entry for this, linking to this thread. It's a portable 7z version only. While it's named 2.6.0pre2 it doesn't guarantee that this feature slips into the actual 2.6.0 release (I was just lazy and trying to save myself from some versioning footwork). Please check it out whether this feels useful to you. It looks and feels pretty good, one small change though. Could you please add the ability to favorite entire folders? with the current setup it's only letting me do individual textures. One problem I noticed as well is that we can't multi select textures, now that decision makes sense because otherwise we could multi select textures and then try to apply that to a brush/face which wouldn't work. Maybe one work around for that is if there are multiple textures selected we can only have an option to add/remove from favorites? like all of the other items in the context menu disappear. That way we can't accidentally try to apply multiple textures to the same brush. But if a single item is selected then we get the full menu when we right click on the entry. I can easily look into the feature letting to add folders to favourites. When a folder is added then all the items below will be added as favourites, right? Not so sure about the multi-selection ability though, that might have some side effects. I have to think about that one. When a folder is added then all the items below will be added as favourites, right? btw is it possible to squeeze this into 2.6.0 ? it's just such a usable feature that it would be fantastic to have it available on release.